What are SILENTY – Low Noise Fireworks? What kind of fireworks are they? The number of products classified as silent fireworks has significantly increased in recent years. Manufacturers and importers try to meet their customers’ needs as much as possible. These changes also concern traditional fireworks; they have become significantly quieter in recent years. This is the effect of the adopted standards which determine the maximum level of noise generated by fireworks. The limit is 120 dB and it applies to ALL pyrotechnic products available on the market, including professional products. The amount of the pyrotechnic chemical used for producing them has also been reduced. Below we present a list of fireworks which according to their description can be classified as SILENTY – Low Noise Fireworks. These are usually materials with sound effects limited to cracks, whistles and hisses instead of bangs. The popular volcanoes (this name comes from the triangular shape the fountains usually have) are a perfect choice if you are organising a quiet fireworks display. Although they don’t burst, they give the spectacular effect of a vertical stream of sparks. When choosing a fountain, you should pay attention to the amount of the pyrotechnic chemical that has a direct impact on the duration of the performance and the quality of the effect generated. You should also keep in mind that some of them additionally include the crackling sound, i.e. the effect of crackling sparks which increases the level of the noise produced to some extent. Another type of silent fireworks is pyrotechnic suns. They also don’t burst and give the effect similar to the fountains, but it is generated on the circumference and sometimes makes the entire firework spin. It’s worth mentioning that some of the pyrotechnic suns generate additional whistling sounds. This may be important if we are looking for completely silent fireworks. Roman candles are oblong tubes which fire coloured fireballs with various effects, one after another. They don’t usually generate any noise, except for the so-called “bazooka fireworks”. Bazooka fireworks are Roman candles of big diameter (usually more than 25 mm); they work similarly to traditional batteries and rockets, generating low noise. Despite some popular practices in recent years, under no circumstances should you hold any lighted Roman candles in your hand! No matter how big they are! Take care of your safety and the safety of the people nearby! In contrast to the articles above, most batteries and rockets available on the market are loud fireworks. But we can also find ones that generate low noise. All batteries and rockets, including SILENTY, produce a dull noise, mainly when the charge is launched and lifted up. But it doesn’t last long and the level of noise is insignificant. If you are able to tolerate a bit more noise, many batteries and rockets produce additional whistles, screeches and crackles. Lanterns have become very popular recently; they are believed to be a symbol of luck. They aren’t classified as fireworks and don’t generate any noise. Bear in mind that they are not always allowed, in particular during summer. Don’t forget the well-known sparklers. Available in various sizes, they are a perfect substitute for bigger fireworks. Fireworks are undoubtedly very spectacular entertainment which is very exciting. Because of that, most of us decide to use them for special occasions. Fireworks are great for wedding and birthday parties, jubilee celebrations and business events. Some people tolerate fireworks only during New Year’s Eve. As for other occasions, they are not too enthusiastic. The elderly, younger children and animals don’t tolerate loud explosions. Below, we present some situations for which silent fireworks can be a useful solution. First, it is worth considering this option if you want to organise a show in built-up areas. It is courtesy to notify the nearby residents that fireworks are to be launched, but it’s not always possible, in particular in bigger towns or cities. In such cases the launching of traditional fireworks usually ends in complaints or calling the police. SILENTY – Low Noise Fireworks are great also when the audience includes children. They will delight you with their effects, but will not scare with extensive noise. When the show is to be held nearby many animals, the effect will be similar. Using low noise fireworks, we don’t have to give up this attraction and we don’t distress our pets. By tradition, fireworks should be launched at midnight, but in fact the situation is slightly different due to the quiet hours. Traditional fireworks are not always tolerated so late at night. In such cases silent fireworks come in handy, in particular during summer when the dusk falls after 10 pm. The organisation of a fireworks display with silent fireworks (units which generate low noise) is a very common practice in the West. But few pyrotechnic companies provide this kind of service in Poland. They often explain that such events are less spectacular, which is completely untrue. 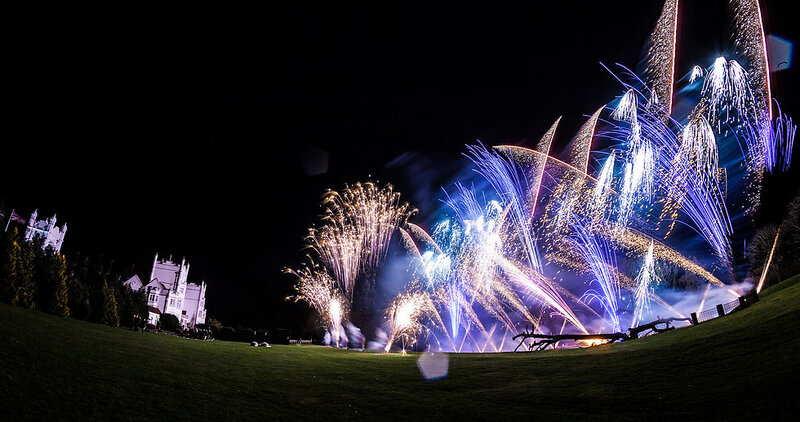 With a bit of commitment, inventiveness and SILENTY, you can create an equally spectacular show as the ones with traditional fireworks. Properly selected materials combined with some effects and precisely choreographed music will ensure an unforgettable show. Bear in mind that if you choose services provided by a pyrotechnic company, you are sure that all safety requirements for the show are met and all formalities are completed. People often forget or don’t know that permits are required for this kind of show. Additionally, an experienced pyrotechnician will precisely tailor the show to your individual needs. Each silent fireworks show – like the traditional one – is different. You can choose the intensity of the show, duration, music, the type of materials and effects. The number of combinations is limitless. Of course, you can always leave the pyrotechnicians to do it all for you, allowing them to show off. Do you need more details? Email us.